Last night cookies were good, really good. I had a few. Everyone needs sometimes a cookie or two?! The main word here is sometimes. And I am perfectly aware of calories I put in. But if I want to loose weight, I need to put in less calories than I burn during a day (or night - according to Calorie Counter I burn 548 cal during eight hours sleep - when I have it that long). Today was one of those "sometimes" when I spent over two hours at the gym on elliptical and in aqua fitness class. And you know what? I think I had more endorphins from my workout than from the cookies... Paradox?! Anyway, along with extra exercises I went vegan for the day. Some of my readers asked me what I eat on my vegan days. 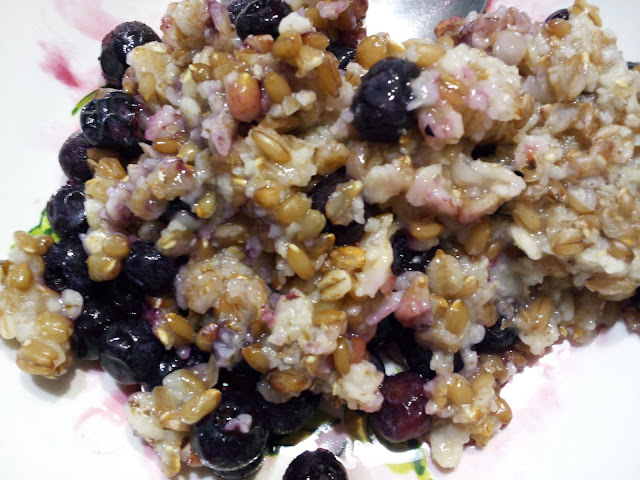 Breakfast - a rolled multigrains and a whole rye hot cereal with a blueberries. 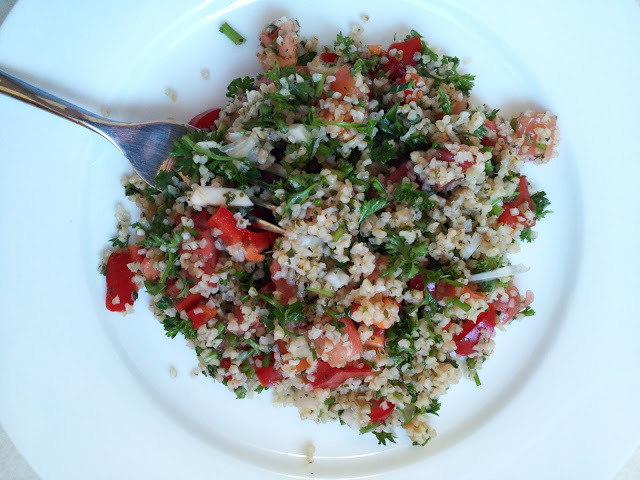 Lunch - Tabbouleh salad (well, a variation actually as I didn't have all the ingredients for a classic Tabbouleh). 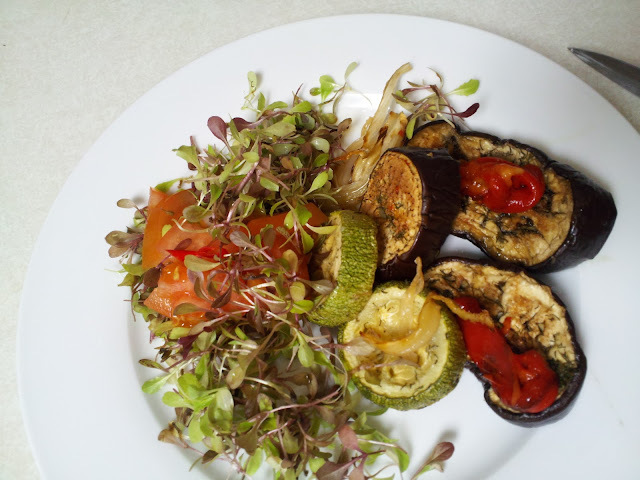 Dinner - a mix of a roasted eggplants, a zucchini, a red pepper, and a fennel with a microgreens salad. I also had about 5 cups of green tea throughout the day, few almonds, an orange, and an apple. Eating vegan is not that hard, but my husband would divorce me if I did all the time ( lol! ) it was very hard when I announced him I would be a vegetarian but eventually he got used to it and now he is a vegetarian at home, pescetarian when we go out (occassionally). He loves milk and eggs so that's something that cannot leave the house! Btw, your food looks very yummy! We do vegetarian about twice a week right now. I like it and the guys seem to be loving it. My daughter has always leaned that way so for her it's easy. The new term is flexitarian if you eat meat occasionally. I am so glad to know there is a name for how my daughter eats now. Lol. Good luck to you. I am struggling to lose some pounds myself. Thank you, Ruth and Kim for your comments. I am glad to have you as my friends!